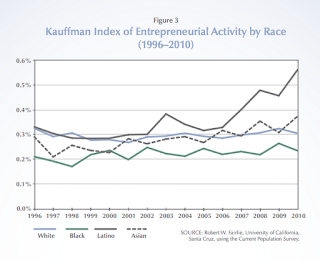 There's no denying it, minority entrepreneurship matters in the United States. And for the budding Latino business entrepreneur, embracing technology and social media is invaluable. When it comes to the future of Latino entrepreneurship, why not start them young with an innovative approach similar to SparkAmerica.us? Better yet, why not learn from some of the most dynamic Latino entrepreneurs that are building interesting things and amassing a growing user base while developing innovative technologies. The place to discover and share Latino interests. 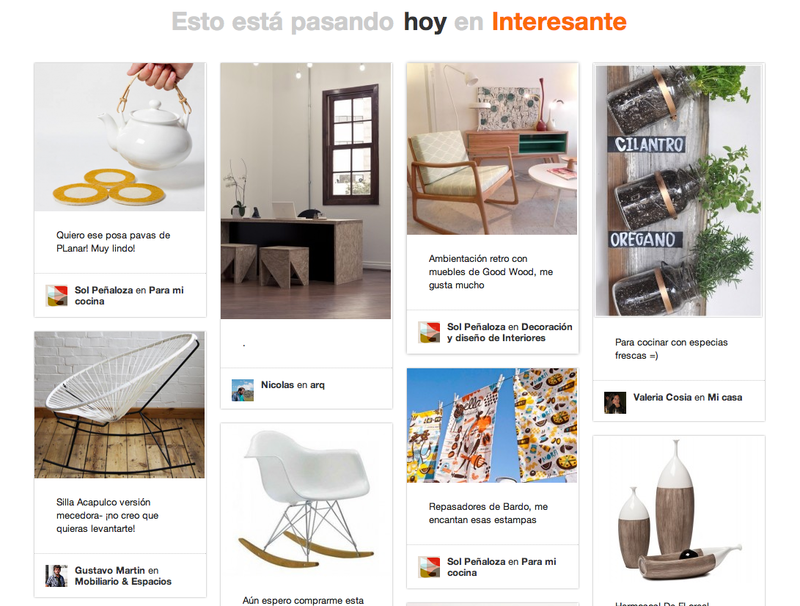 Interesante is a unique startup in beta focused on immersive cultural shear-ability and fueling diaspora-driven commerce. It's a gateway to cultural interests in its most beautiful visual form. Interesante places a special focus on the deeper cultural nuances of social engagement commanding a user base representing over 41 countries including Argentina, the United States, Spain, Mexico, Colombia, Ecuador, Chile, Venezuela, Brazil, and Peru. Interesante is the brain child of Rebecca Padnos Altamirano (CEO) who gracefully assembled a team of approximately ten individuals, largely based in Argentina. These professionals are led by Antonio Altamirano (COO), Pablo Gamba (CTO), Claudio Cossio (VP Marketing), and Leandro Henflen (Design). Antonio is also the co-founder of virtual postcard startup Dabble. Our founder Jose Huitron, recently caught up with Antonio, one of the most prolific Latino entrepreneurs amassing a cross-national track record of unique startup activity. Antonio arrived in the U.S. 13 years ago armed with a keen focus on the huge potential and possibility of entrepreneurship. "I needed to prepare myself to be the best I can be and be ready to launch and test my ideas in the real world. Not only by building a company but helping the community as a whole and in particular, the Latino community," said Antonio. The allure of possibility combined with a passion for action has fueled an environment where Latinos are the future of entrepreneurship in the U.S. Latinos are now trendsetters, cultural icons, successful business people and are at the core of the American cultural fabric. However, no tool has placed the Latino consumer at the top of their pecking order. Enter Interesante. "There are huge highs and massive lows. You go from a place where you feel you're going to conquer the world and some days it looks as if you are climbing Everest. Preparation is paramount to succeed in this environment. The fluctuation is so big you have to be careful, but that is what makes it fun." said Antonio. "Other tools were born out of necessity for a particular need. Facebook doesn't even provide Open Graph in Spanish. We want to be the largest database of interests that are Latino based in the world. For many budding Latino(a) entrepreneurs, the road to real impact requires a focus on identifying, enabling, and mobilizing champions and committed advisors. A real challenge lies in trying to bridge the gap between Latinos who want to do something big and Latinos in the U.S. who can invest and nurture the nascent Latino startup community. Interesante is a benchmark in how to bridge this gap and move inspired Latinos with bold ideas to a place where passion meets action. Rebecca and her team at Interesante are a legitimate force to be reckoned with. They stand as a great example of an innovative startup that is built for Latinos by Latinos. For Antonio and his team, Interesante is much more than a hub of diaspora-driven commerce. It is also a rallying cry for Latino entrepreneurs to step into the arena of innovation with confidence and a belief that your identity fuels the prolific. The future of Latino entrepreneurship is already here. Where are all the Latino innovators? That's a popular question but the answers may be closer than they appear. There's a storm of Latino entrepreneurship activity happening in the U.S. and south of the border. Perhaps, the collectivist nature of Latinos may be a unique factor contributing to the somewhat quiet rise of startup dominance. Hispanic entrepreneurs opened twice as many businesses as the national average in the 2000s, according to U.S. Census data. 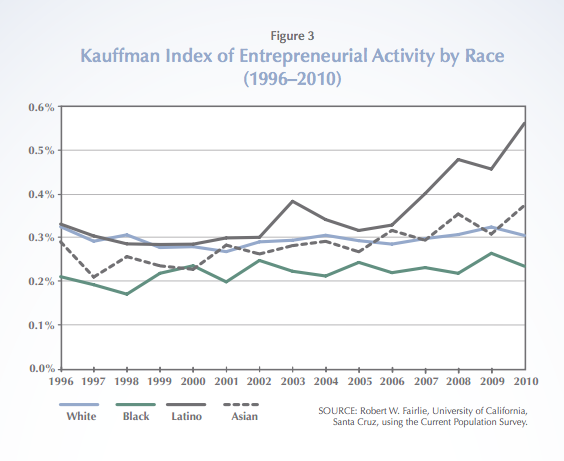 And recent data from the Kauffman Index of Entrepreneurial Activity highlights an interesting surge in entrepreneurship activity by Latinos. The American dream is alive and well. 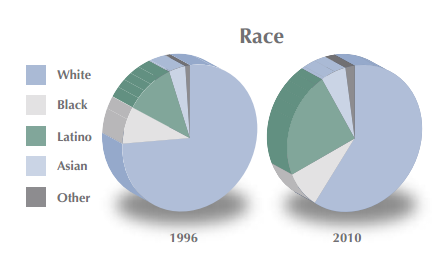 In 2010 immigrants accounted for nearly 30% of new business owners, versus 13% in 1996, according to the Kauffman Foundation. No matter how you cut it, Latinovators are enjoying their share of the entrepreneurship pie. Of particular note, is the work of Jesse and Edwardo Martínez who founded the Latino Startup Alliance which was launched New Year’s Day 2012, now a budding network of over 240 innovators. However, the question remains. Where are the rest of the Latinopreneurs? A mere 20 results show up for "US Hispanic Market" on AngelList which is the de facto standard for keeping tabs on the burgeoning startup arena in the U.S. and beyond. What does this mean? Perhaps, there's a ton of Latino startups listed on the site but are working under the radar with their profile hidden as they move close to launch or a point of desired product/service development. The truth? We need more Latino startups who are not afraid of their identity and the arena of possibility. Inc.com has its own list of Top Latino entrepreneurs who've achieved some striking marks of success and are actively blazing a trail of entrepreneurship activity. There's no denying it, the Latino startup crowd is here and it's kind of a big deal capturing the attention of many, including some of Silicon Valley's most engaged venture capitalists as confirmed by the recent purchase of Mexican.vc by 500 Startups. If we look closely, there's something much bigger in the works. There's a real dynamic taking place where Latino innovators are playing the lead role in the U.S. and beyond.